straight from Linnyland to you. "Let's all go to Linnyland!" HaPpY HaPpY SPRING from Linnyland!! ​Guest Speaking engagement to another! ~ The first Guest Speaking engagement was at Art Gallery of Greater Victoria for the Gallery Associates; there was a full house in the Spencer Mansion for “Linny, Linnyland & Linnyism” — where the delightful Gallery Associates travelled along with me on an adventure to Linnyland -- it was such a pleasure to share time with the wonderful Associates! ​and so pleased to have met the wonderful artist who did it. Your pictures have so much power in them…"
"I just looked up Linny d. Vine and realized that I have loved her work for a long time. 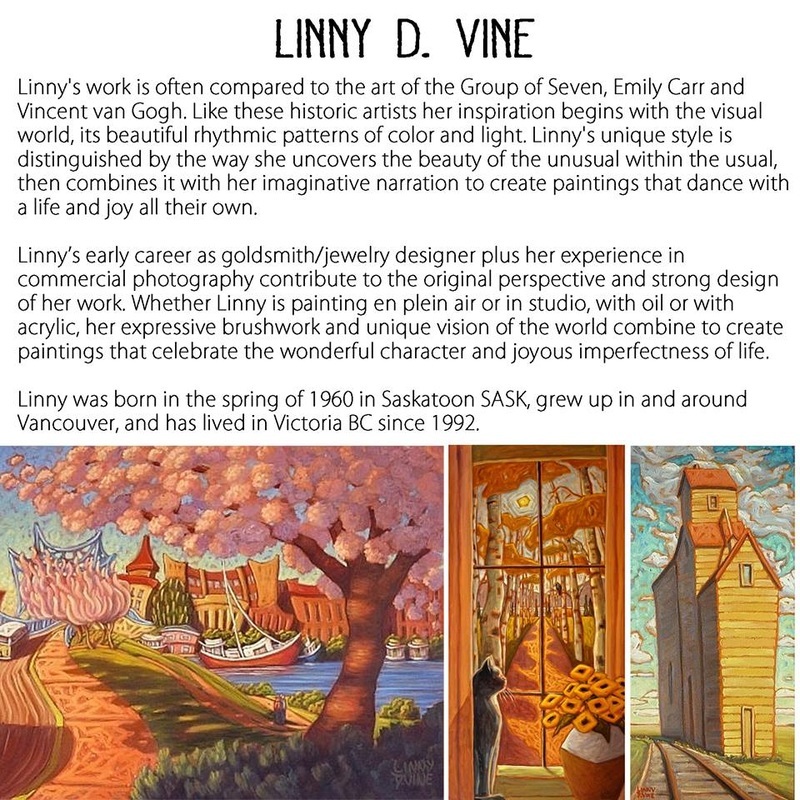 ~ Visit www.linnydvine.com for all that’s NEW & to discover WHERE there are MORE Cherry Blossoms blooming, MORE of the Linnyland VW Buses adventuring, and MORE Linnyland Lighthouses glowing visit: Fine Art Gallery Representation . “Lola” is Cupid’s half-sister, and even though she is prone to “flights of fancy”, she has an amazing ability to get her “point(s) across”. ​in February’s edition of the Edmonton Journal AND in Lando Gallery’s Front Window!! ​~PLUS, PLUS, PLUS, just delivered!! THREE NEW Linnyland paintings to The Gallery in the Oak Bay Village!! ~ Visit www.linnydvine.com for all that’s NEW AND MORE including Fine Art Gallery Representation . ​Happy Wild & Wonderful Month of Love!! Thank-you for being part of Linnyland's WILDLY WONDERFUL 2016!! all of the many Linny/Linnyland/D Vine Collectors AND all of your Commissions, too!! Feeling extremely grateful for a phenomenal year!! Here’s to many more wild and wonderful NEW adventures in 2017!! HaPpY 2017 from Linny & Linnyland!! ** And, on the subject, if you’re considering Commissioning a Linnyland painting for your Sweetie (or for yourself) for Valentine’s Day, NOW is the time!!! ​~ And, speaking of NEWs and of Sweeties and Gifts, ART meets CHOCOLATE has licensed 4 Linnyland images for their delicious Handmade/Fair Trade Chocolate Bars!! ART meets CHOCOLATE meets Linnyland!!!! ~AND just delivered!! THREE NEW Linnyland paintings to Art Gallery of Greater Victoria’s Art Rentals & Sales!! “Magic Time” 36x48, oil on canvas, ©Linny D. Vine at Art Gallery of Greater Victoria (1 of the 3 NEW)!! Adele Campbell Fine Art Gallery in Whistler BC Canada presents their ”24th Annual Winter Exhibition”. Please visit www.linnydvine.com for more, including Event Details & more newness at Fine Art Gallery Representation! ~ “Little Lennard Light” (below) was painted during an October Linnyland painting adventure at Long Beach on Vancouver Island & is one of three new paintings just delivered to the delightful The Gallery in the Oak Bay Village, BC Canada! ~ And, there are two new Linnyland paintings on the way to the amazing Koyman Galleries, in Ottawa Ontario! ~ Plus, two new Linnyland paintings that have just arrived at the lovely Hampton Gallery in Kamloops BC Canada, in time for the excitement of Hampton’s “23rd Annual Winter Show & Sale”! ~ Plus, PLUS there are two new Linnyland paintings “on the road” to the beautiful Adele Campbell Fine Art Gallery in Whistler BC Canada — just in time for Adele’s much anticipated ”24th Annual Winter Exhibition”! ​AND newly named Canadian Senator, the Honourable Patricia Bovey! ...and to “top off” all the wonderfulness of Summer; this recent Commission, “Downtown Deco Extendo” (top painting, below) for the delightful & delighted Linnyland Collector of “Downtown Deco” (bottom painting, below), who is such FUN to create with and for!! ​...because of space constrictions the first Commissioned painting only accommodated the bottom portion of The Marine Building but with a taller wall newly available this doubly delighted Collector now has it all! Earlier this year a Mother & Daughter visited the home of their friend, (and Linnyland Collector), "Shelley". During their visit, the very thoughtful Mother observed her Daughter’s excited reaction to a Linnyland painting. Shortly after the visit this thoughtful Mother made contact and told of her Daughter and her dear and thoughtful ways, she then arranged for a Commission of a Linnyland painting of her Daughter's choosing. It was such a pleasure to create “Sunset Adventure" from this loving Mother for her loving Daughter — AND both Daughter and Mother LOVE it, they decided that it's the two of them in the Linnyland VW bus/van … Alice and Joanne away on their very own adventure! ...And, in Linnyland, February has also been "the month of Commissions"! ​...HAPPY 2016 - fill it with SUNSHINY JOY & ADVENTURES! ... And, guess who is thrilled to be sharing the page of Art Gallery of Greater Victoria’s Gallery Guide with two of her favourite historical Canadian artists!! ​...TWO more galleries representing Linny D. Vine and Linnyland!! 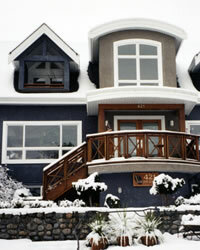 ​Thank-you for the warm and wonderful welcome Van Dop Gallery, New Westminster BC Canada! ​...And happy to announce new gallery representation with Lando Gallery, Edmonton AB Canada. 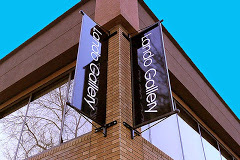 ​Thank-you for the warm welcome Lando Gallery! ...Yes, there's a new face in Ottawas this week - DELIGHTED to share that Canada's largest gallery of art, Koyman Galleries of Ottawa Ontario, now represents Linny D. Vine and Linnyland!! 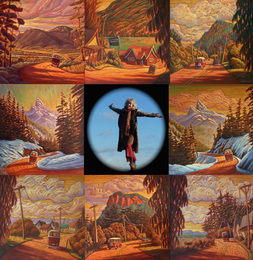 "Linny D. Vine's work incorporates both Emily Carr's emotion and the more formal approach of Robert Genn. friendly and very approachable expressions of sheer joy." ​and it went quickly - the painting, not the new vehicle/the red truck! except on the right, this year’s Paint-In painting, “Special Spot”)! with this year’s Paint-In painting, “Special Spot” on the right. ...Plus, new on the website: “Linnyland art cards” ! or, if you prefer, you may purchase cards online, too! ...yes, the original “Emily Carr House” has sold to a happy D. Vine/Linnyland Collector but art cards of “Emily Carr House” are available at Emily Carr House and at the Art Gallery of Greater Victoria Gallery Shop and online! 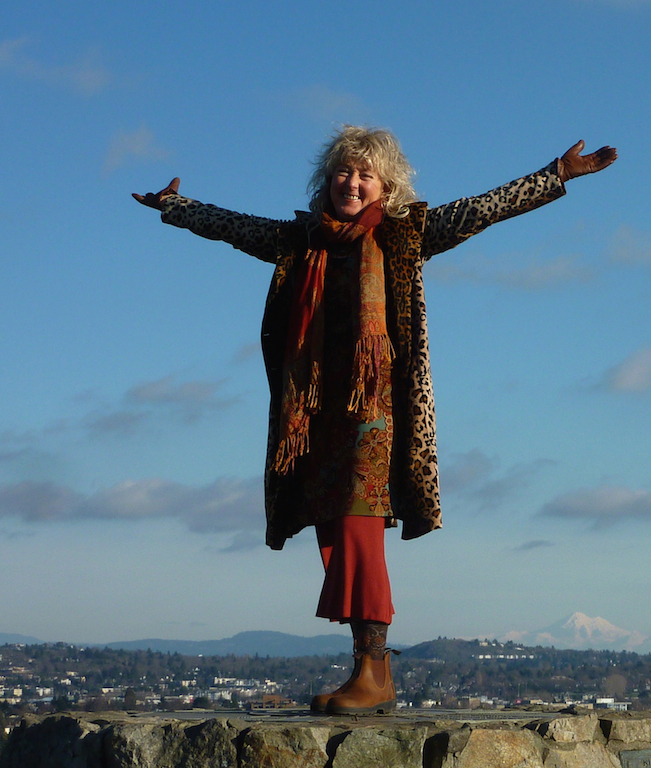 HaPpY HaPpY Wild and Wonder-Full 2015! 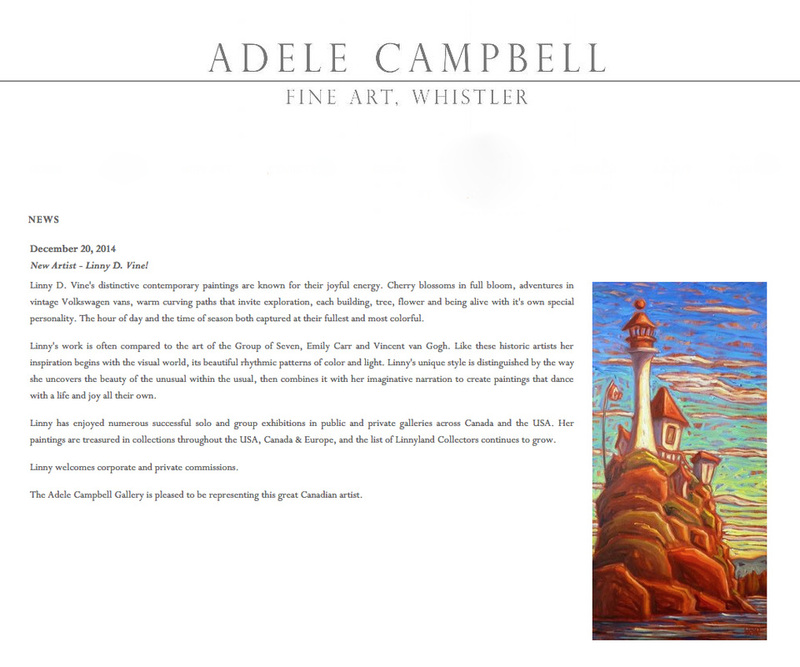 Adele Campbell Fine Art Gallery in Whistler BC Canada! "British Columbia Artists Group Show" with new paintings from their BC artists! features “Artist to Collect: Linny D. Vine”, a 10 page plus article by Brett Annington! is featured on the month of October in West End Gallery’s calendar)! that is similar to a Linnyland painting that has already sold? ...What's Black and Tan with the Linnyland Volkswagen Van? for their "Art Collection Craft Label"! ... This is the 9th year that the Art Gallery of Greater Victoria has invited me to participate in the Paint-In and each year the "Let’s all Go to Linnyland demonstration painting" includes a building from somewhere along Victoria’s Moss Street. ... Summer Salon continues at West End Gallery in Victoria:..
in an outstanding group exhibition. Showcasing the diversity and talent of Canadian artists and their work, landscapes, still lifes, abstracts, impressionists, urban and figurative styles are all represented in this varied collection from an artist line-up that includes Steven Armstrong, Claudette Castonguay, Rod Charlesworth, Richard Cole, Ken Faulks, Greta Guzek, Patricia Johnston, Paul Jorgensen, Elka Nowicka, Guy Roy, Claude A. Simard and Linny D. Vine. This fabulous event is annually named as the city’s “ART EVENT OF THE YEAR”: Don’t miss it! ... It was beautiful Linnyland weather for the early May painting adventure/ Linnyland showtime at Hampton Gallery in Kamloops, BC Canada. A big thank-you to all of the art lovers, friends and new Linnyland Collectors who joined in the fun and celebration! ... And, Linnyland Rocked Kamloops with a live TV interview, too! ... And now, back home, to a great discovery: it’s M Awards Vote Time - and I’ve been nominated!! This year Monday Magazine gathered a team of local arts and entertainment enthusiasts, veterans and industry insiders to determine the nominees for Monday Magazine’s 12th annual M Awards. The annual M Awards recognize Greater Victoria’s best and brightest in the arts and entertainment field." 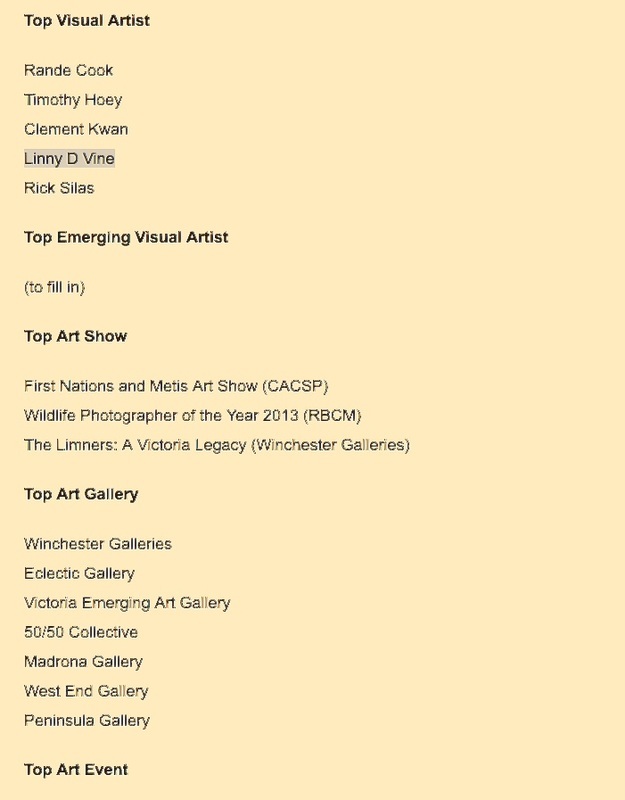 ...Thank-you to EVERYONE who attended the Victoria West End Gallery’s celebration of the “Vancouver Island Group Show”! And great news, Linnyland is now available at West End Gallery's Edmonton location, too!! ~Where else are Linnyland paintings available? Happy Year of the Wild Horse and (in Linnyland) the Wild Unicorn, too! who shared in the wild times at West End Gallery "2013 Winter Collection & Linny D. Vine Show"! ... And to Focus Magazine for the show's preview and image: see here. Thank-you, too, to Jennifer Blyth and Adam Sawatsky for inclusion in their recent articles, read all about it here and here. ...Later this month, in Kamloops BC, it's the "Hampton Gallery's 20th Annual Christmas Show & Sale"
"Linnyland at West End Gallery!" "We are pleased to have local artist Linny D. Vine participate. Known for her bright energy Linny’s paintings are full of joie de vivre. 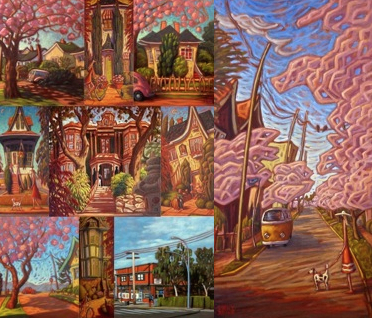 “Like no other, Linny D. Vine combines imagination and expressive brushwork to create a magical world of contemporary nostalgia, a world that celebrates the wonderful character and joyous imperfectness of life. Welcome to Linnyland.”"
... excited to announce that my work is "now" represented by the West End Gallery . 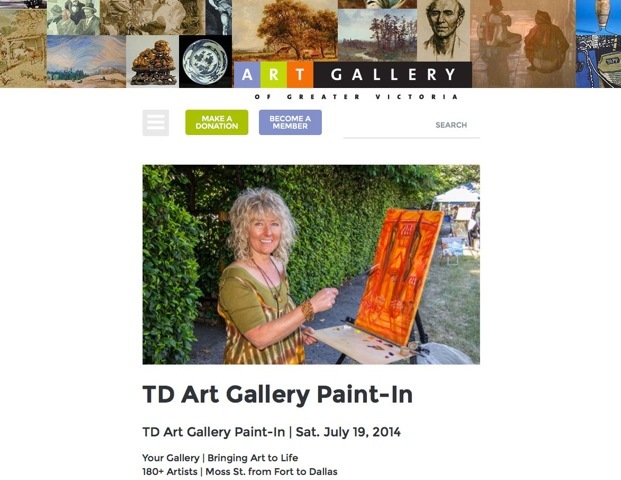 West End Gallery in Victoria, B.C. was established in 1994 and is recognized as the city's most vibrant gallery. "West End Gallery is known for discovering and presenting the finest examples from a broad spectrum of Canadian painting, one-of-a-kind sculpture and contemporary glass art." ...& the July/August issue of Victoria's YAM Magazine featured "Linnyland painting adventures". In case you missed the issue, you can view the great article by John Threlfall's here: YAM Magazine & "Linnyland Painting Adventures"
... & another big thank-you to Paula Griffin of Vancouver Island Style Magazine for her "Divine" Linny D. Vine feature on pages 3 & 12 (click here to view)! ... For the next 6 months look for an exhibition of Linny D. Vine & Robert Amos paintings on display at the Victoria Airport Gallery, in conjunction with the Art Gallery of Greater Victoria. ... One of the Art Gallery of Greater Victoria Representatives asked me to give a presentation called "Art as Business" for Business Victoria - EntreActive ... after all of the serious art business, we played at "putting our best foot forward"! ... Salt Spring/Saltspring Island's Cusheon Lake Resort featured Linnyland in their newsletter, and it was picked up by the Accommodations Group of Salt Spring Island for their newsletter, too. You can read more here. ... Hurray, Hurray! The month of May has brought new gallery representation with Kamloops BC's premier destination for original fine art, the Hampton Gallery. If you're in the area be sure to visit to this important gallery, Hampton Gallery represents art by over 45 distinguished Canadian artists! ... And, "hot off the press"!! The current issue of the Monday Magazine features the Linnyland painting, "Downtown Date" on the front cover! Plus, a wonderful article on Linnyland by Mary Ellen Green! Read the article here. "...The BC Book Publishers Association has licensed a Linny lighthouse painting for the cover of their publication:"
"... and, visit the events page for upcoming shows - the next one is at the Art Beat Gallery in St. Albert, Alberta!" (although, not necessarily in this order)..."
.. and yes, it's true, in Linnyland chocolate is calorie free!" Rendezvous Art Gallery, located at Howe and West Cordova...plus "New Adventures in Linnyland" at the Sooke Harbour House Art Gallery runs from the 26th of September to the 29th of October... Happy Adventuring!"